It’s 1947 in the austerity-ridden, black-market-riddled underworld of post-war Britain. And Jethro, a renowned Cockney cat burglar and jewel thief, sets up a caper to burgle the embassy of a certain unnamed Iron Curtain country. His prize, two fabulous suites of jewelry reputed to have once been the property of Russian aristocracy. The thing is, since the end of the War – with him having served in the Merchant Navy and having had a couple of convoy ships sunk from beneath him – Jethro has told everyone that he’s lost his nerve and has gone straight. And he takes-up as an itinerant stagehand around London’s many theatres and music halls. But the truth is hiding in plain sight in and around London’s West End is the perfect cover for him to set up his diamond capers in the wealthy areas of Mayfair, Belgravia and Knightsbridge. None of London’s top villains – Jack Spot and Billy Hill – believe Jethro has gone straight, and neither does Darby Messima, Soho’s fearsome crime-lord. And at one time or another everyone wants him to do just one more little creeping job for them. But when Jethro turns down Messima’s right-hand man, who wants Jethro to secretly ‘moonlight’ for him, things turn very nasty indeed and Jethro is only saved from being ‘chived’ and crippled for life by the chance intervention of a stranger, Seth. All of which foreshadows a series of deadly and tragic incidents on the streets of London. To add to his troubles, the Embassy caper also brings Jethro to the attention of Colonel Walsingham of MI5. Walsingham blackmails Jethro into committing burglary in Defence of the Realm.” Jethro’s mission, to burgle the very same Embassy, only this time to retrieve an all-important code book and to lift “a real jewel”, a female Soviet cypher-clerk that desperately wants to defect. All hell breaks lose when Jethro burgles the Embassy for a second time and one of the Soviet’s most formidable secret agents swears to track him down and kill him to revenge the deed. It’s the perfect set up for ‘a thief to catch a thief,’ that leads to a deadly game of cat and mouse. The question is, who will get to Jethro first: His Majesty’s Secret Service, London’s most fearsome gangsters, or the Soviets’ own master thief and assassin? This knockout first novel carries the reader deep into the labyrinthine streets of London immediately after World War II. Broadbent's hero, cat burglar Jethro, fits perfectly into this post-Blitz zeitgeist. A witty and jaunty opportunist, Jethro serves as combination narrator and tour guide through his own adventures and craft. The first four chapters (arguably one of the most exquisitely suspenseful openings in crime fiction) offer Jethro's take on a "creep" (slang for a cat burglary) he conducts in the Soviet Embassy... Remarkable history-mystery with fascinating background. "The best stories take the reader into new worlds and experiences. 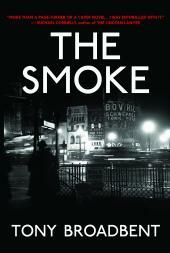 Tony Broadbent proves that with wonderful skill in The Smoke. More than a page-turner or a caper novel, it's about a time and place uniquely and expertly captured . . . . I was enthralled by it."